Yes, I’ve finally gotten around to part 3 of 3 in my rtorrent with wtorrent tutorial. 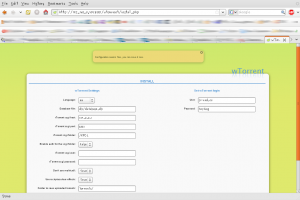 Wtorrent is an excellent webui for rtorrent and after this tutorial you’ll be able to manage rtorrent from the web…forward a port and you can even connect to your wdtv from the internet to queue up torrents! This writeup presumes that you have already executed the steps from part 1 and part 2. If you haven’t done them yet, then get over and complete them first! 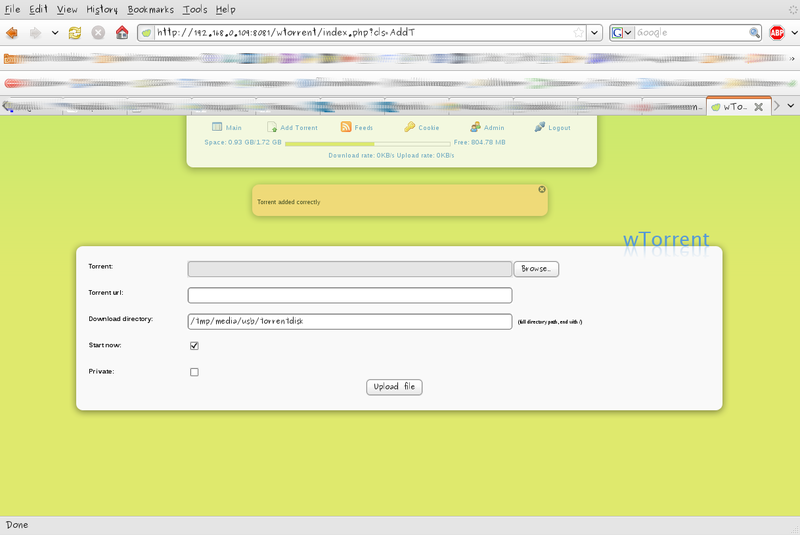 First ssh/telnet into your WDTV, then update your Optware feed and download the latest wtorrent. Now that we have the latest version, lets unzip it to our web server location and do a bit of file maintenance to get things in working order. Whew, now that bit of (undocumented) house cleaning is taken care of we need to modify the configuration for rtorrent to enable the xmlrpc server. I still haven't gotten around to patching S99rtorrent in Optware. For a temporary solution there is an S99rtorrent that will work for now, check the comment section of part 1of3 of this series. ( 7:25:43) Using 'select' based polling. ( 7:25:43) XMLRPC initialized with 444 functions. Ok, we’re gettin closer. Now we just need to install one package I accidentally left off (sqlite2) the lighttpd tutorial and then enable the modules in php.ini. Now its time to enable and configure the SCGI server module in lighttpd. For good style I’ll place the config file in /opt/etc/lighttpd/conf.d/. All .conf files located in this directory are parsed each time lighttpd starts. This makes things a bit more modular. The next step is optional. If your wdtv is not accessible from the public internet, then you can skip this step. If you are forwarding an external port to your wdtv so you can manage wtorrent remotely, then yes you definitely want to do this. 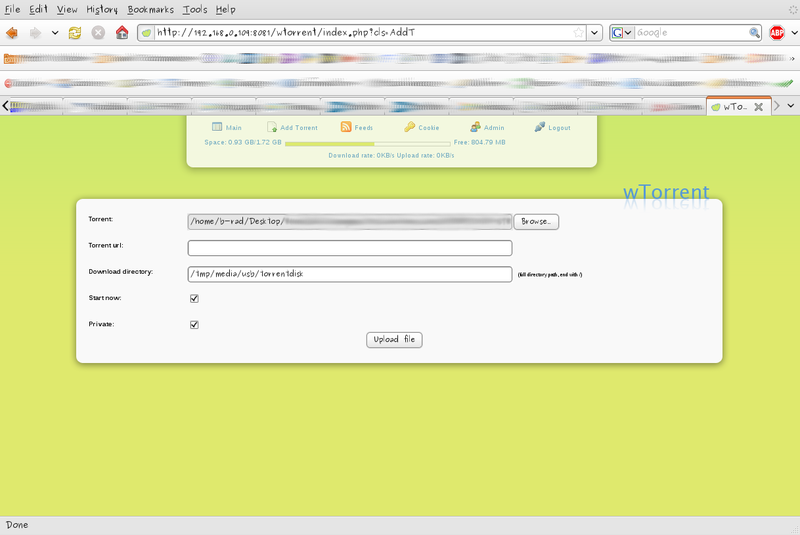 Now when you attempt to access wtorrent you’ll be prompted for a username/password, without disclosing whats behind the auth. One last thing we need to do before SCGI is finished, we need to create the directory and set its permissions. 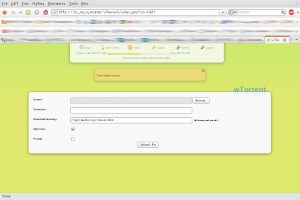 Valid user/password combinations are stored in /opt/etc/lighttpd/.passwd. We’ll need to create a little script to add user/password combo’s to this file. Now I’ll generate a user so I can connect, when things are finished. You can change wtorrent.on.wdtv to anything you desire (maybe something less obvious), just be sure there are no spaces in the string. Are we there yet? Almost. We first need to restart lighttpd to reflect our config changes and kill php-fcgi so it loads the sqlite modules. Now we're finally ready to run wtorrents web installer and get things underway. You should be welcomed by the install screen. Heres what my config looks like...notice that it asks you for rtorrents scgi port, but I've entered the webserver port instead. I imagine that is a typo on wtorrents part, you must enter your lighttpd port there. When SCGI was enabled earlier we set it to only be exposed to the loopback, so no need to have a username/password there. Now there are two things that we need to do before starting, delete install.php like wtorrents asks and protect the wtorrent db from being downloaded. Restart lighttpd now to reflect that change, then how bout we take wtorrent for a testdrive? 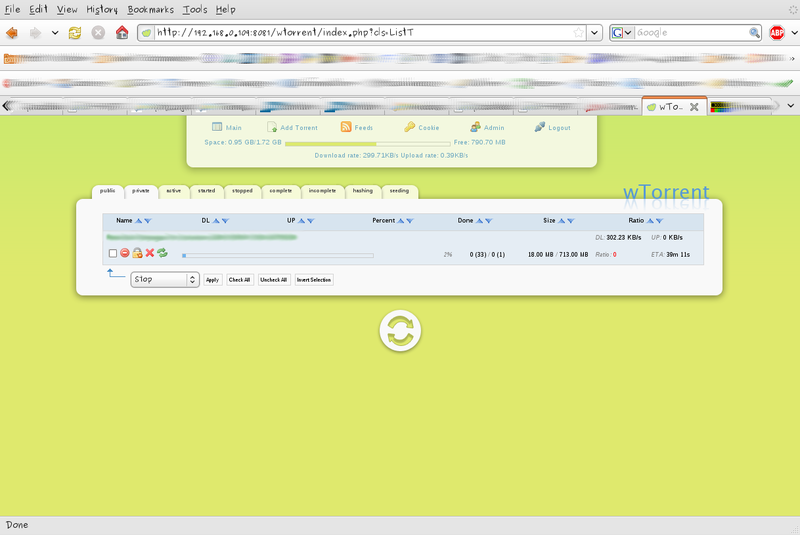 Ok, navigate to http://<your wdtv's ip>:8081/wtorrent. You're greeted by wtorrents internal log in page, if you enabled mod_auth earlier you'll have to enter a user/password before you access wtorrent. After logging in you're dropped in to the torrent listings. If your rtorrent has torrents currently running you'll see them here, I don't have anything downloading at the moment. I'll click on add torrent to see about adding something. I've selected something and checked private, since this is a private torrent, now I'll click to upload. Lets go back to the main view to see if the torrent is running. Awesome! You now have the ability to add torrents to your wdtv from anywhere in the world...and you don't have to go to the console at all!!! the wdtv is not a powerful web server, give rtorrent/wtorrent time to respond and don't be impatient. I spend a tremendous amount of time hacking the WDTV firmware and writing up stuff like this, so if you appreciate my efforts please donate a little something using the link below : ) Thanks & enjoy. 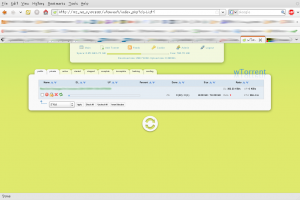 Have you compared rtorrent+wtorrent with transmission, which provides its own web UI, and for which different Windows/Linux clients are available (transmission remote gui & transmission remote dotnet) ? Very good write up. The only thing I saw missing was configuring of user.conf.php. There are a couple of lines in there that need edited, or else you will get a blank (white)page when trying to load wtorrent. Not a major mistake, but you mention restarting a couple of the init scripts, but give the wrong file name(/opt/etc/init.d/S99rtorrent, instead of /opt/etc/init.d/rtorrent.) Something most will figure out on there own and fix and keep on trucking with the guide. I did start fresh. I believe the blank page error will occur if you do not edit this section in user.conf.php. If you look at your lighttpd log, you will see some error about not being able to find some file. This may be useful if anyone else encounters the error. b-rad i have a request!!! I use my WDLXTV as part of my home cinema kit with about 400 movies which include about 100 in HiDef. My wife loves looking through the DVD covers but would like information about the movie from the likes of imbd move database to help her choose a movie. All my movies are in individual folders as i use http://www.mymovies.dk software to tag them with cover art and movie info for use with windows media centre. i.e.Genre, Rating, Movie Summary ect. So would it be possible to include in a future update as im sure this add even more value to this great product. I would like to ask you to publish all your files on bittorent network. I am ready to keep your files in my bittorent share. Are there any lizenensing issues, not allowing me to do so? Maybe you need your eyes checked or perhaps a new monitor. I have no problems with this website. 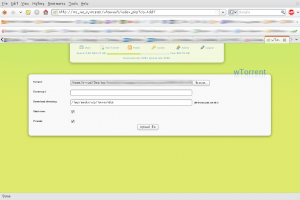 I tried this tutorial part1, 2 and now the wtorrent guide. The next funny thing is that it asks me for a wtorrent password and username and I’m not talking about the htpasswd prompt…it’s the actual gui asking for a username and password. If I click login it just goes blank. BTW I applied the fix that takinover83 suggested also to get to this point. Before that I wasn’t getting anything at all. Gee I’m really giving this tutorial a thorough work over. Config tested fine and am saving now. Will post back if I find anything else. As well realtbo's init.d modification is not ideal. It might work, but its more a temporary hack. If I can find the time I will patch the Optware package. I’ve limited knowledge of telnet/linux and have got quite far through this tutorial but now when I telnet in and type a command (ie ipkg update) I get a message ‘SIGUSR1′ – how do I stop this happening ? Do you have any idea why does rtorrent quits/crashes after some time? I just added 1 torrent to download, ~800MB size, wtorrent shows download in progress, but after some time, when i click refresh in wtorrent, it shows “Error: cannot connect to rtorrent”. When i check ps on wdtv, i cannot see rtorrent running and i need to restart it. I would really like to try it but it doesn’t work for me. Everything looks fine except the last part. I found the fix in wtorrent project Ticket #104. Awesome work! Everything went smooth for me except the rtorrent startup script. I did use the modified version which works if I just run it from console (/opt/etc/init.d/S99rtorrent-correct). The correct script does not work on starting/rebooting the device. After rebooting, if I try screen -r in the console, all I get is a terminal with the session directory /opt/share/torrent active. Comments? Did it again and its working fine now thanks..
Any ideia wath is it? 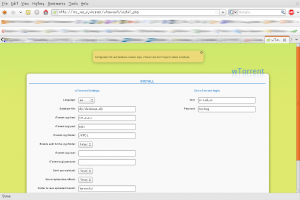 Why not just use Torrentfulx… its available in optware. I too got the “no such applet” error. It was because I had spaces in the “/opt/bin/htpasswd” file we created. Make sure there are no spaces in front of “#!/bin/sh”. is there an encryption option? my isp throttles torrents and makes it impossible to download anything if I do not have encryption enabled. i have not purchased a media player b/c i am trying to find one with all the features i would like. a torrent option is great but i need encryption to bypass my isp. I have some problems when I’ve tried to add a new torrent. The wtorrrent keep telling me that the torrent file is not a torrent file. I looked into source code and I’ve observed that in AddT file, in function addRemoteTorrent, the first 13 charcters are read in buffer and then looking for “announce” string, which is actually present in the torrent file. How can we avoid this situation without modifiying the source code and building? I was able to do everything until I start getting ’500 – Internal Server Error’ when I call the install.php page (http://my_wdlxtv_ip:8081/wtorrent/install.php). 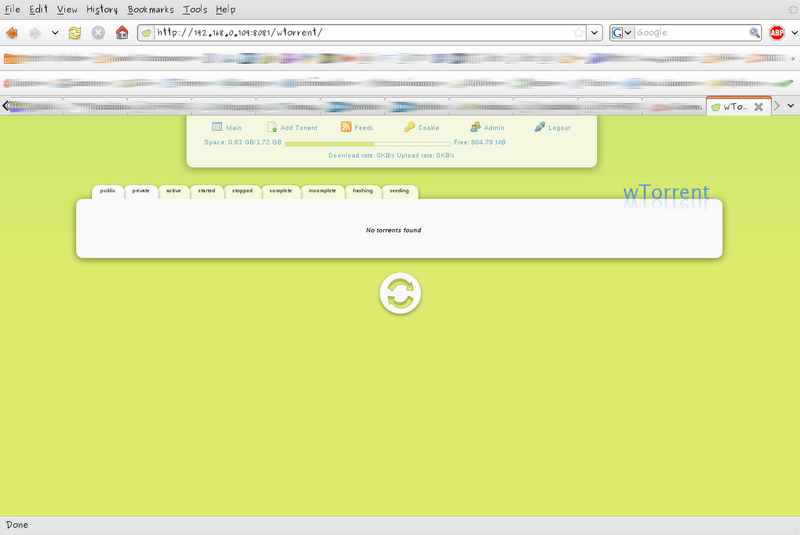 It was working before trying put wTorrent to work. Did anyone had this same problem. 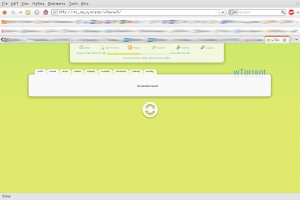 wtorrent website does not have the build. Can anyone upload it somewhere ? Google was of no help. Appreciate your help. I got wtorrent-current.zip from the following link instead of the link given in the article. Hope this helps someone.